Before I really understand how this could happen so fast there is another pair of finished socks. Strange enough, they also have nothing to do with either of my current a-longs. They are neither red nor pink nor sizzling and not at all Sockapaloooza socks. What happened? Well, don't ask me! This is the fourth pair I am knitting in the Rib and Cable pattern - not a word to waste on this topic! Regia yarn is also an old-time-favourite of mine, so no point there either. But... these socks are not modelled because they are too big. That's okay because they are not for me. The happy (or not so - I'll come to this later) recipient i my sister. Yes, she would like to have a pair of hand-knitted socks (she doesn't know how to knit herself). There have been some clarifying phone calls on terms of fiber, colour and pattern preferences. The result was warm, thick, soft, huuuge socks, probably closer to legwarmers. For colour preferences my dear sister mentioned neutrals such as sand, off-white, caramel... 'Pattern' was not requested at all. WHY did I knit these socks for her!? How did it happen that the Vancouver skein shouted at me to be knit into socks for my sister? I mean, I know that she will probably not appreciate the bright green and blue stripes. 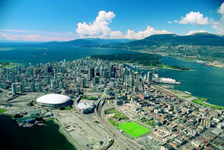 There is also not a teeny-weeny connection to Vancouver. And to make it all even more mysterious: I don't even feel a glimpse of guilt or uncertainty about these socks. Very strange.. I will find out, though. Probably, her disgusted screams (when she opens the parcel) will carry till here. I was wondering about the name Vancouver for this yarn. Honestly, how do they come up with the fancy colourway names in the first place? And then, green, blue, yellow stripes? Well, it was time for some research. That is Vancouver's city flag. Looking familiar? And these city views? I am soo surprised that the yarn actually has something to do with the name. I have another skein called Ottawa somewhere in my stash and I am very excited to find out where the inspiration for that name came from in 'real life'. by Carola at 9:42 e.h. I love the rib and cable pattern. I knit mine in Bearfoot, and while I love the yarn, I'm not crazy about the way the mohair hides the cables. I love yours in the smooth yarn! mars 27, 2006 1:55 f.h. mars 27, 2006 9:19 f.h. They look great Carola! How pairs of socks do you have knit from that pattern? I'm thinking I must be missing out on something and need to knit that pattern. Enjoy! mars 27, 2006 1:44 e.h. I do stuff like that for my sister all the time. Eventually she will come to accept it. Or learn to knit for herself. Of course, your sister's crazy if she doesn't like 'em - beautiful colors! mars 27, 2006 7:27 e.h.
Fabulous Vancouver socks for your lucky sister. The stripes are beautiful and look lovely with the Rib & cable pattern. 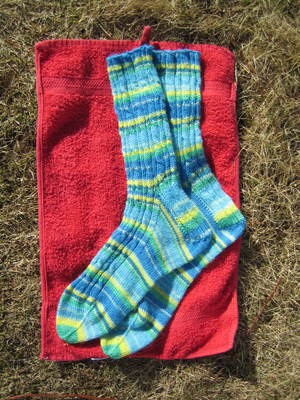 I will have to find some of this Regia; I have seen other bloggers with similar socks and love the colours! mars 27, 2006 7:49 e.h.
What cracks me up is that you have knit your sister socks that you know she didn't request, but you made them anyway! I hope that she does appreciate them. They are beautiful. 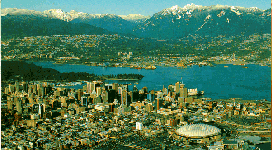 I love it that you felt compelled to find out more info about the "Vancouver" name. It does seem to reflect the landscape of the area, which is pretty neat. If your sister doesn't like them, maybe she will send them back! I love that colorway. I think I will have to buy some of those too! mars 27, 2006 9:42 e.h. I love those Vancouver socks! So pretty! I hope your sister falls in love with them too. mars 29, 2006 3:18 f.h. I am a Canadian Occupational Therapy student who is headed to Iceland for eight weeks in May. I was wondering, what is the price of yarn there? Obviously it must vary, but do you know if it is more expensive than here in Canada? Thanks, I havn't been able to find this info anywhere!! It's not in any of my travel guides and I need to know how much yarn to pack!!! mars 29, 2006 3:48 f.h. mars 31, 2006 12:25 f.h. The Vancouver socks are awesome! No need to make everything for certain projects or knitalongs. Variety is the spice of life! I love the striping, and it is great how it incorporates the Vancouver flag colors. Very cool! Hope you are well, Carola! mars 31, 2006 3:55 e.h.
Do you like the rib and cable pattern? I was thinking of using it for my next pair of socks. I have some pretty forest green sock yarn in -- argh -- Regia? Opal? Can't remember. Anyway, yours are terrific! apríl 03, 2006 2:07 e.h. I came across your blog after discovering that Regia HAD a line of yarn named after Canadian cities.. Being from Ottawa I can help you out on that front - tulips, Parliament buildings and the canal! september 09, 2006 4:05 f.h. desember 01, 2006 6:51 e.h.